Creative minds often find business difficult. 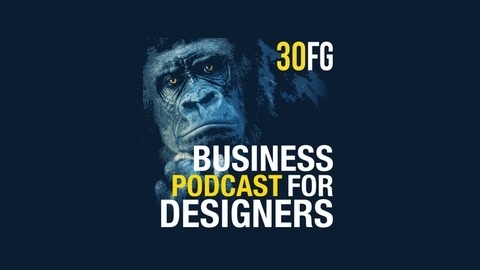 The 30FG Business Podcast for Designers aims to help design professionals develop a business mindset. If you’re considering becoming a freelancer, starting a small design practice or dream of growing your existing practice into something much bigger, this podcast is here to help. 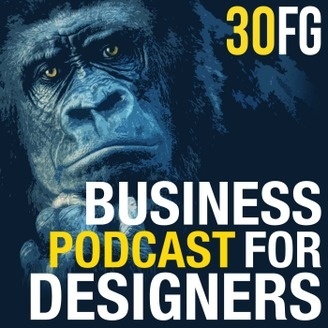 This podcast is specifically intended for designers in the creative fields of architecture, graphic design, landscape architecture and interior design. Each week on the podcast we interview creatives from Australia and around the world to find out what they’re up to and ask them to share their insights into just what it takes to get paid for doing what you love. We discuss their experiences of taking the leap from employee to free agent, steps to take before you make the move, thinking about the long term, choosing a business structure, dealing with taxation, collaborating with others, building star teams, determining what you’re worth and how much to charge and all other the intertwined aspects of being a designer and running a business. As you already know there are plenty of resources around that help you with the creative side of being creative, and likewise there are plenty of resources and services online and offline to help you with the business side of doing business.. but as you have probably already discovered, there isn’t much that out there that brings them together and deals with the business side of creativity. Taking a small business course at a local college or community education centre can be very expensive and time consuming. Rarely do they focus on the specific needs and nature of being paid to be a designer. We’re building a supportive community that helps each other grow, share and learn from the experiences of our peers and connect designers via in-person events around the world. This week we are privledged to have Architect Mark R LePage of FiveCat Studio also the host of the Entrepreneur Architect with us to discuss a topic that is relevant and important to anyone wanting to own a business. This interview will give creative business owners and freelancers some practical insights into the difference between being a creative and being the owner of a business that provides creative services. It’s common knowledge that most business fail. Several might make it through the first year, about half might make it through the second, and every year after that it seems, the number of people who stay in business just keeps on halving. This is true for everybody, including creatives. The question is, why is that? We have all the information we need, a lot of it for free, about how to start and run a business. On Amazon alone right now there are OVER 2 million books listed under the term “business”. We come from fortunate educated backgrounds and many of us have worked for successful companies. Why then do so many people fail, and what are we to do about it? My hunch, and I base this on personal experience, is that as creatives, almost all of us at some time reach a point where we start thinking, “Hey, I’m really good at my job, I don’t need this employer, I’m certain I could be much more successful financially if I worked for myself.” It’s at that point that they miss an extremely important distinction.. Being talented and successful creatively, does NOT qualify you one bit to run a business. This discussion is for the creative who is contemplating starting their own practice. They’ve most likely been working under someone else’s wing for a few years and are feeling the urge to get out on their own, probably for the flexibility and the dream of being their own boss and being in control of their finances. I admire them and encourage each one to do what their heart tells them, but before they go, this interview will arm them not only with a few basic truths, but some excellent ideas of what to do next to improve their knowledge and chances of success.